As a mold removal company Eradicator’s mold employees are often faced with removing damaged building materials. Some of these building materials often will be determined unrestorable. With that being the case Eradicator mold has determined the need to assist clients that may require these items that were removed to be replaced. One such example is carpets and padding. These items often may suffer water damage due to a boiler and/or plumbing pipes being ruptured and flooding the area of concern. Carpets are often a common place to find mold spores. This is due to the nature of carpeting being a hotbed for dust mites, unfortunately this is perfect for mold spores to live in. While mold spores often lay dormant, the right combination of humidity/water and lack of light especially within basements can speed the process of abnormal mold growth. Eradicator Mold inspectors highly suggests that quickly attending to the issue is key and that unless the carpeting is being cleaned by a specialist then it should be replaced. This is essential to prevent the growth of mold within the home or place of business and ensuring that your investment is not comprised. If such a need arises Eradicator’s mold employees are able to assist by replacing the padding and carpeting with a color and texture of your choice. Eradicator will assist by utilizing the necessary tools to return your home to a normal level of fungal activity. 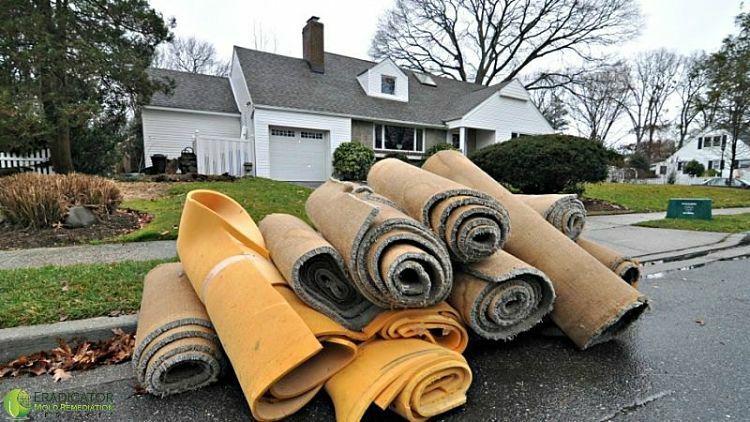 If it is determined that the carpeting in question is not severely affected, then we will provide suggestions. By utilizing a combination of fans and commercial dehumidifiers we will assist with removing the excess humidity. If it has been determined that the water damaged suffered is excessive our mold inspector will walk you through the necessary steps to determine if it is best to remove and replace. Feel free to reach out to our organization to determine if our services are best for you.